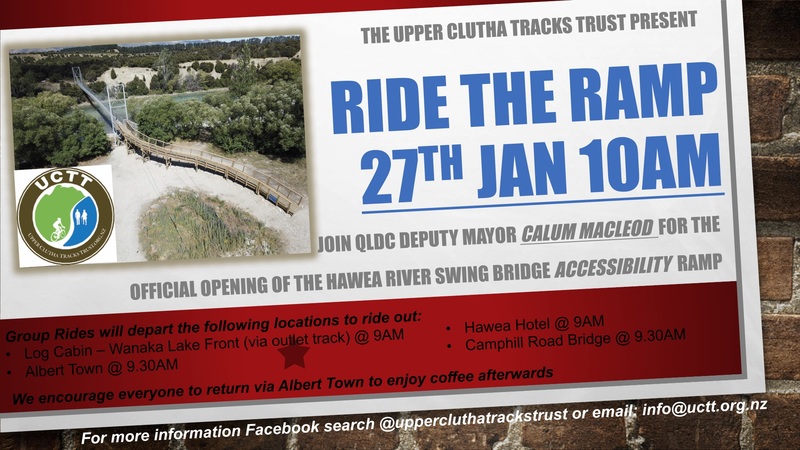 To celebrate the offical opening of the new accessibility ramp adjoining the Hawea River Swing Bridge, the Upper Clutha Tracks Trust invite one and all to come and ride (stroll, push or walk) the ramp on Sunday 27th January. Groups will depart the following locations at the times listed below. If you are wanting to walk or run, we suggest leaving a little earlier. An official opening of the new ramp will happen at 10AM with Queenstown Lakes District Council Deputy Mayor Calum MacLeod officiating with ribbon cutting duties. Easy vehicle access for those travelling by car is via the Albert Town Hawea River Campground access road off SH6. We encourage everyone to continue on to Albert Town for coffee afterwards (because a ride/run/walk/stroll is always better with coffee and Albert Town is home to some of the finest caffeinated drops in the district, all conveniently situated beside our local tracks). Construction was completed in early December for the 2018/19 summer holiday season that sees many locals and visitors alike make the most of the long days and holiday period to get out and enjoy the local trail networks connecting the Upper Clutha. 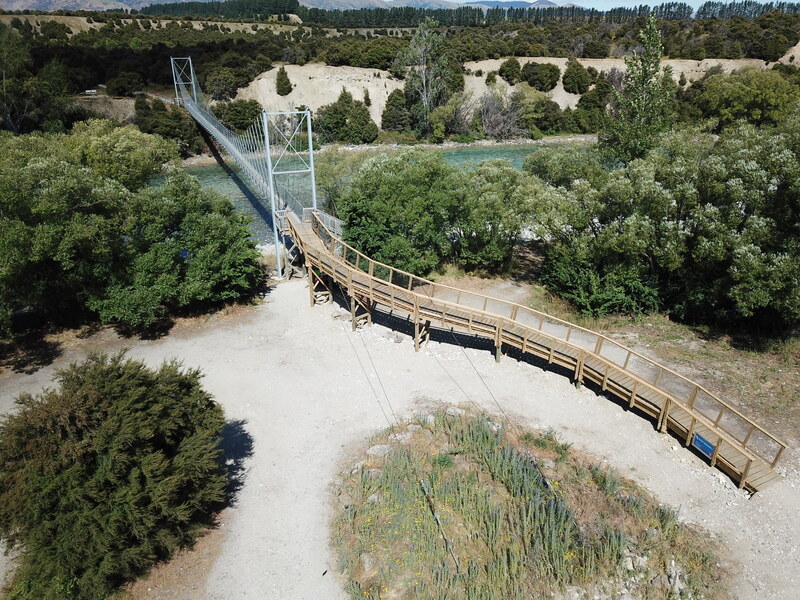 Six weeks on, the Hawea Swing Bridge Ramp has proven to be a resounding success for locals and visitors alike as well as the marking a successful first major build milestone by the Upper Clutha Tracks Trust as part of their Accessibility project. The ramp was built by local builder Roy Bailey with the construction of the ramp made possible by the joint fundraising efforts of local physiotherapist Kate Turner and Bikevember as well as the generous support of local/regional trusts, funding organisations and individuals. One of the key initiatives of the UCTT is to improve “accessibility” for all. Starting with the removal of chicanes and styles from popular local tracks, the Hawea River Swing Bridge Accessibility Ramp represents the first major accessibility construction project with the aim of ongoing improvement of access to the track network for wheel chairs, strollers, electric bikes and recumbent bikes in the Upper Clutha area. The Upper Clutha Tracks Trust is a non profit organisation dedicated to developing a high quality network of public trails around Wanaka and the Upper Clutha Basin. The Trust is made up of eleven passionate members of the Wanaka community, plus representatives from the Queenstown Lakes District Council and the Department of Conservation.